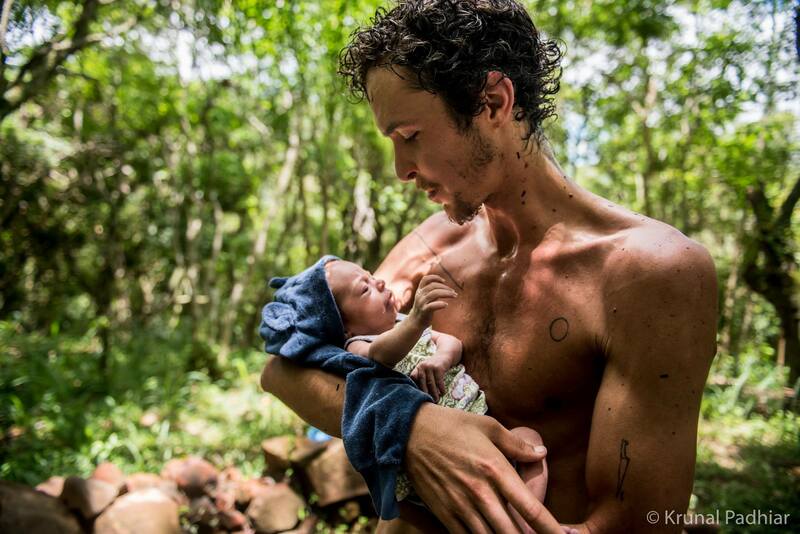 24 days old Sabina Blu comes out of a Native American sweat-lodge ceremony originating in Mexico called Temazcal with her father Tomas. As well as cleansing the body, Temazcal has the power to bring us back to our centre; calm, collected and in tune with our body. This can be explained by the heat experienced during the Temazcal, which can be very challenging. With little to no space to move & with others sitting in and around you, the steam that is released of hot stones (revered as grandmothers) can be hard to endure. There is an urge to want to leave as the mind thinks its in trouble and fear mounts. By surrendering to the heat that Temazcal brings, and singing sacred songs with others inside the dome shaped hut, thoughts of wanting to leave wane, overcome by the power of the shared heart. During this process, there is an understanding and discovery of ones own inner-strength and power as a human being.